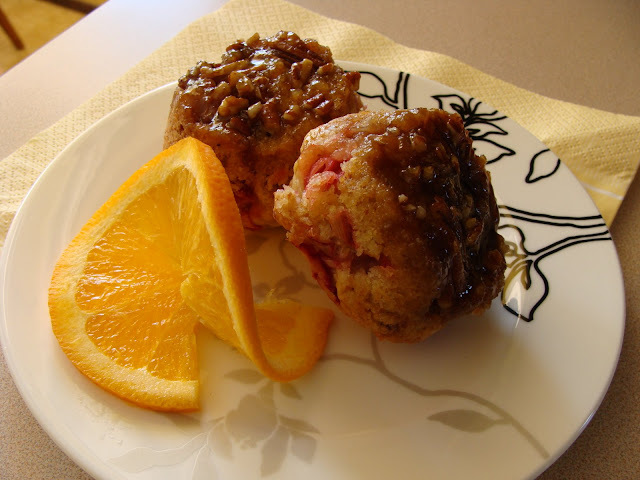 My good friend Betti makes these wonderful Rhubarb Orange Muffins. One day I tried adding a sticky pecan mixture to the bottom of the muffin cups before spooning in the batter and now I make them like this each spring during rhubarb season. add 3/4 cup chopped pecans to the muffin batter. Grease muffin pans. I use pans that make medium sized muffins and I usually get 16 muffins from this recipe. Place 3 or 4 pecan halves in the bottom of each cup. In medium bowl, beat egg. Add oil, orange juice and orange rind to beaten eggs. Add liquid mixture to dry mixture all at once and stir just until moistened. Spoon over brown sugar/pecan mixture in prepared muffin pans. Bake for at 350 degrees F for 25 - 30 minutes. Remove from oven, loosen sides of muffins and turn upside down on a rack. These muffins look gourmet! Beautiful! great recipe..I actually made these muffins yesterday. I did a search and came up with this recipe. Nice flavour combination. Rhubarb muffins are always good but you made them extra special! ooh that looks so yummy. I love rhubarb but I always need to cut it with something else. Orange is a great idea. Thanks for visiting my blog for Outdoor Wednesday and for your kind comment. AND, Can you adopt me? Everything looks delish!!!!! I've made these too .. .anything rhubarb is wonderful. ..thanks for posting it Bev. Golly, those muffins look gorgeous and this certainly is the time of year to make them. Old rhubarb toughens and that wouldn't do for these little gems. I love your blog and will be back often. those look amazing! Can't wait to try them out! We're making these now but I didn't see an oven temp. maybe I missed it!? I'l assume350*! thanks! I will have to try these as soon as I get some pecans. That's what stopped me when I thought I should make them today. Yes yes yes, I want to make these muffins. I love pecans and rhubarb, and I'd never thought of mixing them. yummy. These look delicious. I must give it a try~! Made these yesterday,and very yummy.But I made them with the baking cups,and just one suggestion,peel them before they cool down ,as the sauce in the bottom gets hard and one can't enjoy the yummy syrup and nuts,the way one would like!! Had to re-comment! Made these yesterday and they were DELICIOUS!! I didn't have orange rind, or pecans so I used walnuts and I didn't have cream so I used milk and both were great substitutes! I would HIGHLY recommend you invert them right away! I dumped them out onto a baking sheet lined with foil! DELICIOUS and a great way to harvest your rhubarb!! We have just finished eating our seconds...hmmmm, heavenly. I used my Texas muffin tins...made 12. They're going to be a regular every rhubarb season. Thank you! Made these today... YUMMY! I used silicone muffin cups, it worked great... the sauce doesn't stick to the cups at all! Where do I go wrong with these? They taste great, but..... the sugar mixture on the bottom, always bubbles up and over all over the pan/oven. Perhaps you're putting a bit too much sugar mixtures in the bottom of each cup. Put a bit less in next time and see how that works.